Android has an awful lot of games, and each month brings new titles. Knowing which ones are any good can be tricky. So we’ve put together a list of the best games that we’ve discovered on the Play Store—just three each month to ensure that only games we’ve played make it onto the list. It’s the shortest month of the year, so you don’t want to waste your precious time playing boring games. Here are my top three recommendations to make the most of those minutes this February. Langrisser strategy involves moving squads of troops (such as lancers, cavalry, infantry) led by fantasy heroes of different classes (oriented to melee, magic, buffing, healing etc.) around a tactical map, with success relying on using the right unit types and character abilities effectively. It’s surprisingly deep, especially when you consider the many divergent build options for your heroes. Aesthetically, the game is gorgeous if you appreciate the very Japanese style. The English voice-over is also excellent and there’s plenty of story to keep you going and get a sense of your characters motivations, and also lots of side-quests and missions to complete. While all this is great for free, just bear in mind that Langrisser is a typical gacha RPG, with a random reward system with seemingly low chances of winning the best heroes, and an energy bar that limits long play sessions. I played the game regularly in short bursts for some weeks. It’s a satisfying loop of tasks and rewards, but eventually arrives at a point where you have to keep playing out a lot of repetitive battles, or pay to skip the grind. The new year is here and with it comes new games! If you want to get away from the cold weather and huddle with your phone, we’ve found some great brain teasers to entertain you. This month’s selection will challenge you in unexpected ways and test your abilities to think outside of the box. Let’s get into it! If you miss the brick breaker games of old, this game delivers the old-school experience with a modern twist. 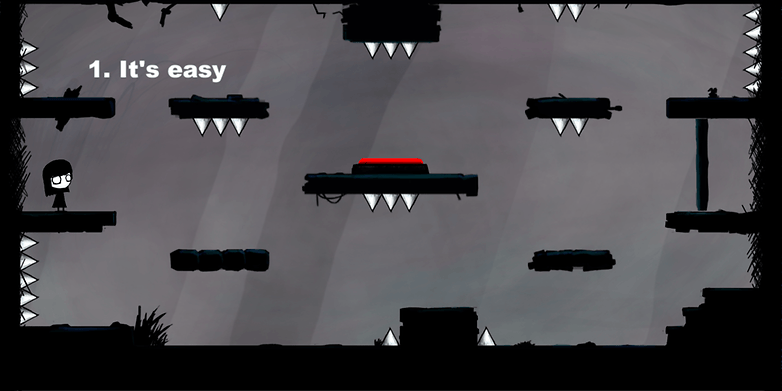 In each level, you are presented with a neon lights fixture which you need to creatively destroy. You do so with the help of three tools – pinballs, ninja stars and bombs. Each has its own physics mechanics and interacts with the lights differently, delivering a challenging and satisfying experience. Unlike the games of old, however, you don’t have a paddle to help you bounce the balls back up, so you have to use your resources carefully. The levels aren’t terribly challenging, but they require mastering the use of the different tools. The game also has a great atmosphere, thanks to its masterful neon light art. On top of all that, Hit The Light by Happymagenta UAB is free to play and does not have obnoxious in-game purchases or intrusive ads. Tired of game tutorials that constantly pop up to explain the most basic things? Sick of unimaginative puzzles? Then That Level Again 4 might be the game for you. Fourth in its series, this indie game by developer IamTagir, doesn’t hold your hand. It drops you straight into a pit full of spikes and lets you scramble to find a way out on your own. To do so you need to press buttons… most of the time. However, the game often forces you to think outside of the box. It somewhat reminds me of The Impossible Quiz – a similarly hard flash game from the early 2000s. Like it, That Level Again 4 breaks the fourth wall and turns everything on its head in the most unexpected ways. If you want to challenge yourself this year, definitely give this game a play. A tale of crime, intrigue and corruption – This is the Police. Taking on the role of police chief Jack Boyd, you come face to face with the seedy underbelly of the city of Freeburg, where the game is set. Initially released for PC in 2016, this indie title is now available on Android. It will have you facing tough choices and crafting masterful strategies, as your goal is to see the chief retire with $500,000 in the bank in just 180 days. Whether you will turn into a corrupt cop or remain righteous and fair is all up to you. The straight and narrow path is not easy, however. You will be tempted by bribes carefully masked as favors and tested at every opportunity. Your choices are definitely not arbitrary. This is the Police is a game about compromises and it’s definitely worth your time despite its relatively high price for a mobile game. It will deliver hours of intrigue and entertainment. While I was looking forward to present The Elder Scrolls: Blades to you all this month, it looks like that won’t be happening, as Bethesda has kicked the game into next year. But there are still plenty of great games to sink you teeth into, alongside your seasonal treats. RPG fans won’t go empty handed either! Beamdog continues its journey to bring the beloved Bioware RPGs of yesteryear to modern formats. After the success of the Baldur’s Gate series, Icewind Dale and Planescape: Torment, it’s Neverwinter Nights’ turn now. The game’s early-era 3D graphics have been polished and the UI has been overhauled to make it easier to play on modern mobile devices. If you already played the game on PC, you can even transfer your saved games and purchased modules over to mobile, and enjoy cross-platform multiplayer with your desktop-bound friends. The game itself stands the test of time, especially since it comes with all the expansions, which in my mind improved a lot on the base game’s story. And on top of that, you have access to user-created modules – adventures made by players like you, some of which match or even best the base content in quality. For your 10 bucks, that’s potentially hundreds of hours of adventure. For newbies, this is a Dungeons and Dragons game, so that means all the fantasy RPG tropes you can think of. Explore cities, exotic locales, meet strange creatures, and (usually) kill them for fortune and glory. The variety of classes and races on offer let you build almost any type of hero you can think of. Over and over again, with no need to pay extra for the privilege. Aaah, the good old days. This is the latest in a series of puzzle/escape games and this time the action set in the ancient world. Faraway 4 is great for quick brain teasers to occupy your mind during your commute or other short breaks. Inspired by the classic explore-and-puzzle adventure Myst, the Faraway series stands out with its elegant visuals and smooth controls. You take on the role of an archaeologist exploring Greco-Roman environments in search of the solution to a family mystery. The attractive colors and ambient music makes discovering puzzles and hunting for clues relaxing, but the puzzles themselves are satisfyingly challenging. Faraway 4 is free to download, which nets you 9 levels – each of which could take a couple of hours or more to solve. Once you complete them, you should be in a good place to decide whether you want to give $3 to unlock the rest of the game. The latest offering from the creator of Samorost and Machinarium to hit the Play Store, Chuchel is an beautifully designed adventure game with a big heart and a great sense of humor (and a wonderful soundtrack from DVA to boot). You play as a fuzzy black creature on a quest for a cherry. To get your juicy prize, you’ve got to experiment with all the objects in the cartoonish environment, often with delightfully absurd consequences. The real joy of Chuchel lies in the pure silliness of the characters and situations, which have been wonderfully crafted to bring out the inner child in you. The game poses its puzzles in a series of short episodes that throw increasingly mad scenarios at you, each with different mechanics to keep things fresh. It’s hard not to play this without cracking into a full-blown grin, as you punch through an army of teeth, crack open a giant sentient egg monster or get teased by a giant jelly dessert. Chuchel is a puzzle/adventure game, sure, but it’s the whimsical/comedic experience that makes it really special. What were your favorite games from the last month(ish)? Let us know in the comments below and we’ll try and check them out!